I’ve shared a ton of recipes over the past year, and one of the things I’ve realized is that I don’t do a great job of talking about the recipes that we use on a regular basis for our family. 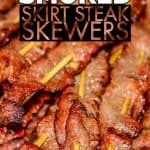 This smoked skirt steak skewers recipe is a great example of that. 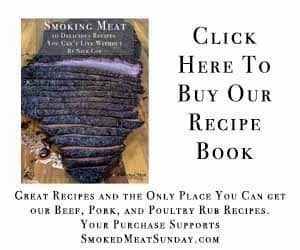 We love making juicy lucy’s, and smoked fatty’s. Briskets and pulled pork are delicious too, but they’re just not practical for a weeknight family meal. My wife started making these skirt steak skewers over a year ago, and they make an appearance on our family’s weeknight dinner menu about once per month. I’d love to say that this was my idea, but it’s not! 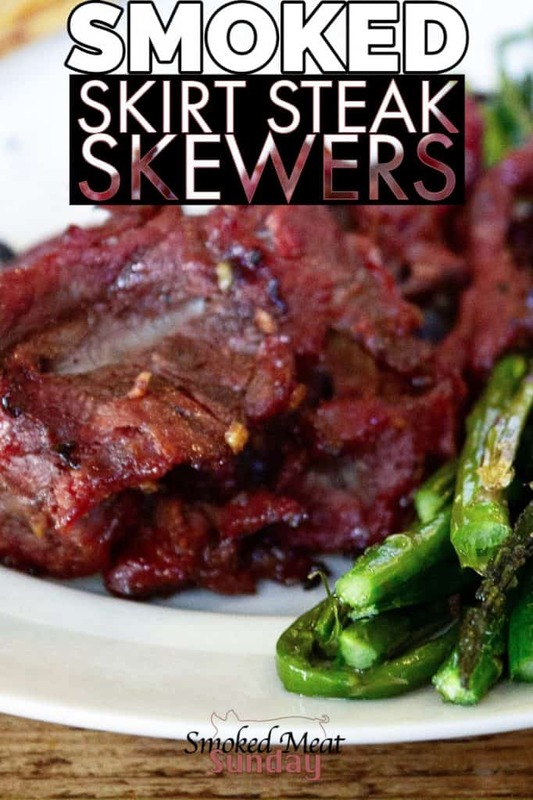 For the original recipe check out this post: Grilled Skirt Steak Skewers. We do our best to eat clean and keep the carbs / sugar to a minimum in our diet. I’m not saying we are perfect, but meals like this make it easy. The flavor is really good, and the meat practically melts in your mouth it’s so tender. The other great thing about this recipe is that it doesn’t take too long to prepare, and cooking doesn’t take long either! To be fair, my wife usually slices the steak and prepares the marinade while I’m at work. All I have to do when I get home is throw them on the grill. Sooooo, it’s easy for me to say how easy this recipe is :). There are just a few things you’ll need to make these smoked skirt steak skewers. Making the marinade for skirt steak skewers is simple. Just combine all of the above ingredients (minus the steak and skewers) in a zip lock. Lay the skirt steak out horizontal to you and flat on your cutting board. Notice the grain of the meat throughout the skirt steak. Slice the skirt steak into equal 6-10″ sections WITH the grain of the meat. Then, turn the newly formed smaller slabs perpendicular to you, and slice each slab into smaller 1″ slices AGAINST the grain. The grain of the meat should be running left to right while you slice from top to bottom. Once you’ve sliced your skirt steak into smaller strips put the meat in a large ziplock with the marinade, and let it chill in the refrigerator for up to 2 hours. While the meat sits in the marinade, soak your bamboo skewers in water too. When you’re ready to make the skewers, turn your grill on and set it up to cook at 180 degrees. While the grill is getting up to temp thread the slices of meat onto the skewers. 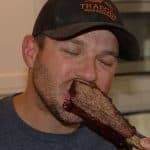 One slice of meat per skewer. When the grill gets up to temp place the skewers directly on the grill grate, and let them smoke for about ten minutes. This will allow them to take on a little bit of that smoky flavor you love. After ten minutes turn the heat up to 400 degrees. Let the skewers cook for about 5 minutes, and then flip each of them and cook for an additional five minutes. It’s tough to check the temp on these since they are so thin. My best advice is to keep an eye on them, and if you see any of them starting to char, they are definitely done. It won’t hurt you to take these off early! Serve these alongside some grilled vegetables or a salad for a delicious and easy weeknight meal. Thanks again to Elise for sharing this great meal. Our family loves it! I'd love to say that this was my idea, but it's not! 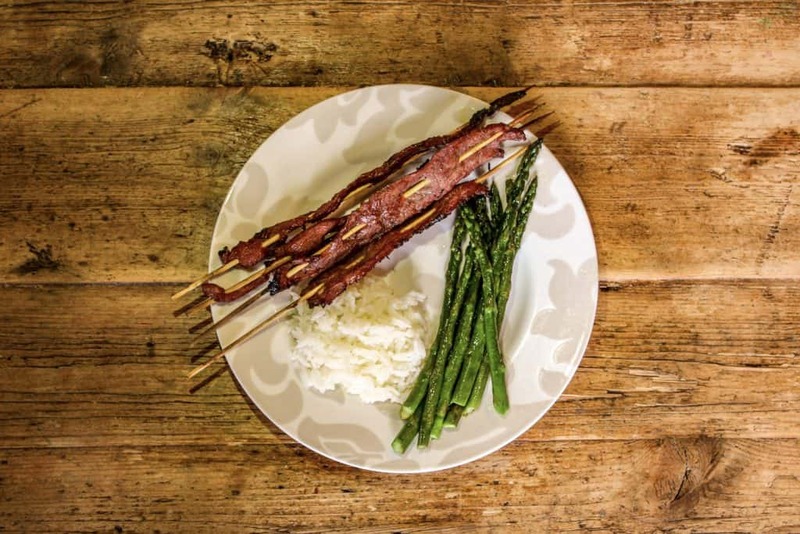 For the original recipe check out this post: Grilled Skirt Steak Skewers. We do our best to eat clean and keep the carbs / sugar to a minimum in our diet. I'm not saying we are perfect, but meals like this make it easy. The flavor is really good, and the meat practically melts in your mouth it's so tender. Combine all of the above ingredients (minus the steak and skewers) in a zip lock to create your marinade. Slice the skirt steak into equal 6-10" sections WITH the grain of the meat. Then, turn the newly formed smaller slabs perpendicular to you, and slice each slab into smaller 1" slices AGAINST the grain. Once you've sliced your skirt steak into smaller strips put the meat in a large ziplock with the marinade, and let it chill in the refrigerator for up to 2 hours. When you're ready to make the skewers, turn your grill on and set it up to cook at 180 degrees. While the grill is getting up to temp thread the slices of meat onto the skewers. 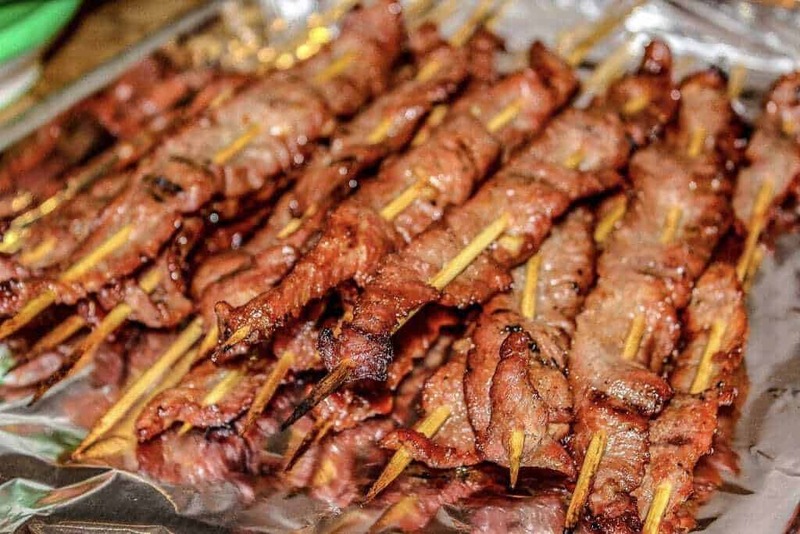 One slice of meat per skewer. When the grill gets up to temp place the skewers directly on the grill grate, and let them smoke for about ten minutes. It's tough to check the temp on these since they are so thin. My best advice is to keep an eye on them, and if you see any of them starting to char, they are definitely done.